On Nov. 20, the FEI announced that Lee McKeever, groom to four-time Olympian McLain Ward, has won the 2018 FEI Best Groom Award. 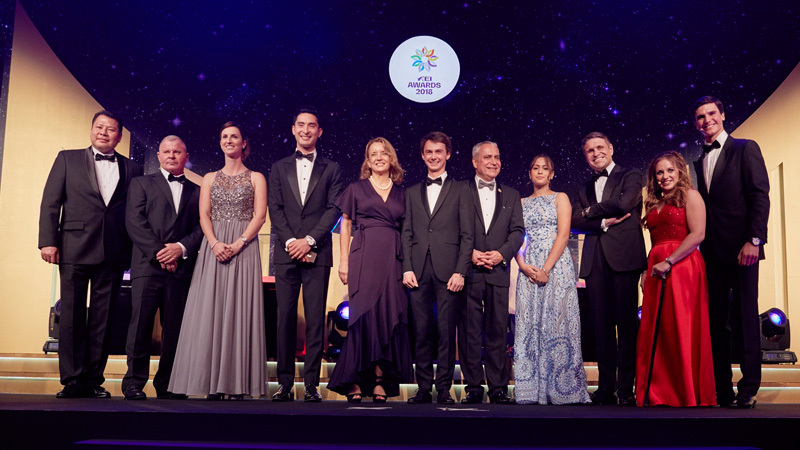 Outgoing FEI Bureau members Hanfried Haring and John McEwen presented McKeever with the prestigious honor at the FEI Awards Gala in Manama, Bahrain, in front of hundreds of equestrian fans, fellow FEI Award recipients, and stakeholders representing 133 National Equestrian Federations. The FEI Best Groom Award spotlights the individual working behind the scenes to ensure the best possible care for the horse. The general-public and an expert panel determined the award winners, each accounting for 50 percent of the vote. McKeever has served as Ward’s groom and barn manager for over 30 years. During this time span, he has overseen Ward’s support team and traveled to major world-class competitions, such as the Olympic Games, Pan American Games, FEI World Equestrian Games and Longines FEI Jumping World Cup Finals. He has been the backbone behind Ward’s monumental career, responsible for the care, well-being and preparation for Ward’s prized equine partners. His due diligence and infallible expertise has contributed to Ward’s success, including victories such as the 2018 FEI World Equestrian Games (North Carolina) team gold medal with Clinta, the 2017 Longines FEI World Cup Jumping Final title (Nevada) and the Rio 2016 Olympic Games team silver medal with HH Azur, the 2015 Pan American Games (Toronto) individual gold medal with Rothchild, and team gold medals at the Beijing 2008 and Athens 2004 Olympic Games with Sapphire.